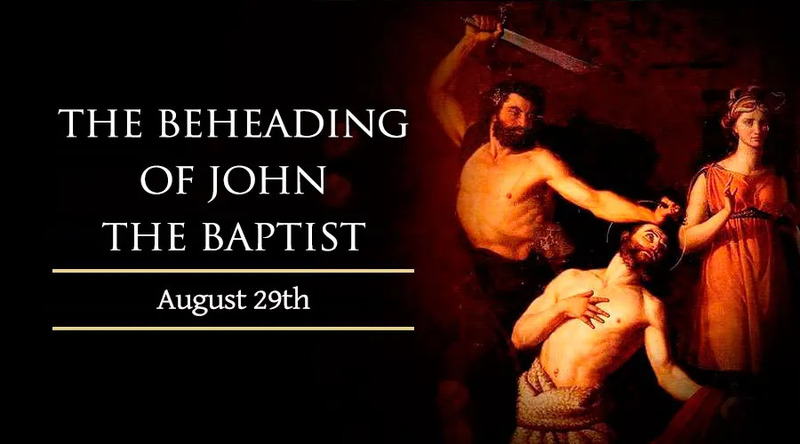 On this day, the universal Church marks the beheading of John the Baptist, who prepared the way for Jesus. As an adult, he lived as a hermit in the wilderness. After the Spirit inspired him, he went about preaching that the people should repent of their sins and be baptized in order to prepare for the Messiah. Herod imprisoned John because he had condemned Herod for committing adultery by living with his brother's wife, Herodias. At he celebration for Herod on his birthday, the daughter of Herodias danced for him, and Herod was so impressed that he said he would offer her anything she liked. She consulted with Herodias who told her to ask for the head of John the Baptist on a platter. Herod did not want to kill John for fear or what his follwers might do, but because of his promise to the girl he could not refuse, and so John was beheaded.